Good car deals are not easy to come by, but at Honda of Gainesville you can expect to find plenty of new car specials to choose from. Whether you are looking for a sporty car like the Honda Civic or a family SUV such as the Honda CR-V, we’ve got you covered. We know buying a new car is a major investment; that’s why we offer leasing and financing specials to help you get the best car for you. 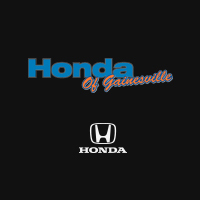 At Honda of Gainesville, the customer is in charge. You are free to consider a wide variety of vehicles in the size and price class you want without any haggles. We offer a simple buying process. All you have to do is choose the model, trim level and options you want, and our Honda experts will do the rest. If you have a soon to be or recent graduate on your hands, be sure to get them qualified for our Honda Graduate Program. For more savings, check out our service offers to keep your new car in top notch condition. Call us at 352-261-5545 to learn more about our current specials today!